RAPAPORT... Michael Hill’s sales fell 0.8% in its third fiscal quarter, even as strategic changes drove an improvement in March, the company said. Group revenue slipped to AUD 117.6 million ($84.2 million) in the three months ending March 31, the jeweler reported Wednesday. During the first two months of the period, the company was in a transition period as it shifted to a new marketing strategy. It also faced challenging conditions in Australia, its largest market. Same-store sales — at branches open for at least a year — slid 1.5% during the third quarter. However, sales improved in March, as the effects of the consumer-driven strategy were fully realized. The initiative focuses on aligning the company’s merchandise with its customers’ needs, as well as restructuring its marketing to move away from continual discounting. In line with this new approach, the company launched a proprietary line in March, the Southern Star diamond collection, it noted. 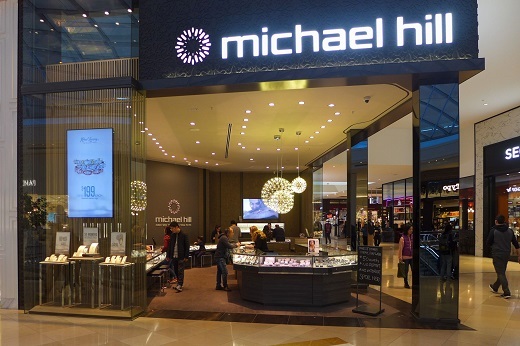 “The company’s performance continued to stabilize during the quarter, as refinements to the strategy improved our position from the first half, further regaining ground lost in the first quarter,” said Michael Hill CEO Daniel Bracken. Same-store sales in Australia declined by 3.4% to AUD 61.9 million ($44.3 million), while those in New Zealand dropped 6.3% to NZD 24.7 million ($16.7 million). Same-store sales in Canada rose 0.1% to CAD 23.6 million ($17.7 million). Total group revenue for the first nine months of the fiscal year fell 3.2% to AUD 427.2 million ($306 million), while same-store sales for the period decreased by 4.8% to AUD 401.4 million ($287.6 million). The group opened one new store during the period, and closed five, bringing the total number to 307 on March 31.